It may sound clichéd, but being in the Republic of Ireland really does feel like you’re in a fairytale. Its green hills, with their grazing cattle, and historic castles make it a truly mystical country. A road trip is definitely the best way to explore Ireland, but take your time, as the country’s cliffside roads are extremely narrow! One of Ireland’s most popular drives is the Ring of Kerry, a 179-kilometer-long circuit around the Iveragh peninsula. The Ring of Kerry’s starting point is the small town of Killarney, famous for its national park. This is home to the 15th century Ross Castle at Lake Lough Lean, and the 19th century Victorian Muckross House at Muckross Lake. The route will then take you past shimmering lakes, over majestic mountains, along beautiful coast lines, and through dense forests. Be sure to stop in the small, picturesque towns, and check out some of the viewing points, such as Ladies View, which overlooks Killarney’s lake district. If you have enough time, don’t miss out on the short detour via Skellig Ring, a coastal road with beautiful beaches, great views over the Atlantic, and a 6th century monastery on the Skellig Michael Island. The Ring of Kerry is a popular road trip. A much shorter route is the Dingle Peninsula (48 km) just north of the Ring of Kerry. 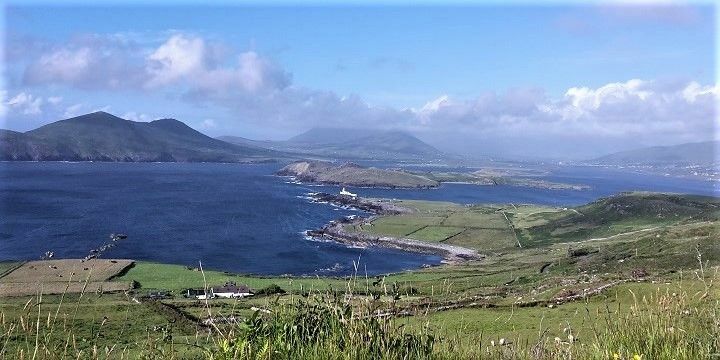 It includes Conor Pass — Ireland’s highest mountain pass — from which you’ll get breathtaking views over the Dingle Peninsula. Be sure to check out the historic ruins, and sandy bays, and stop for a drink in the colorful town of Dingle. With less than 2,000 inhabitants, but more than 50 pubs, it’s known as the world’s greatest pub town. If you want to spend some more time on the road, drive along the 2,500-kilometer-long Wild Atlantic Way. This will take you from Kinsale in the Southwest and onto Malin Head, Ireland’s most northern point. The route includes the Ring of Kerry, the Dingle Peninsula, and the majestic Cliffs of Moher. Trek along the 200-meter-high cliffs, whilst listening to the waves crashing onto the shore. Be careful: the heavy rainfall and fog might add to the mystic atmosphere, but they also make the ground very slippery. 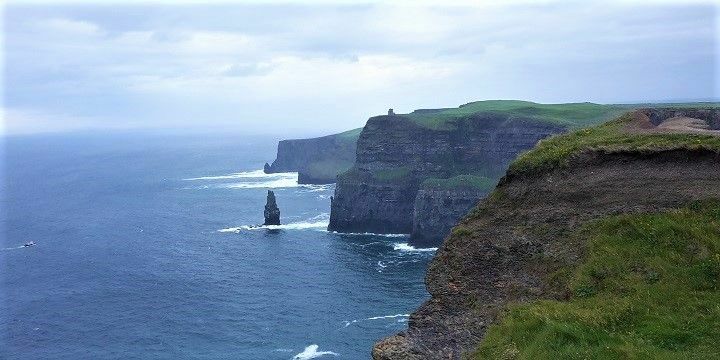 The Cliffs of Moher are located along the Wild Atlantic Way. Head inland and you’ll come across Kilkenny, also known as Ireland’s Medieval Capital. Most of its best-known sites, such as the beautiful St. Canice’s Cathedral and 12th-century Kilkenny Castle are located along the town’s so-called Medieval Mile. 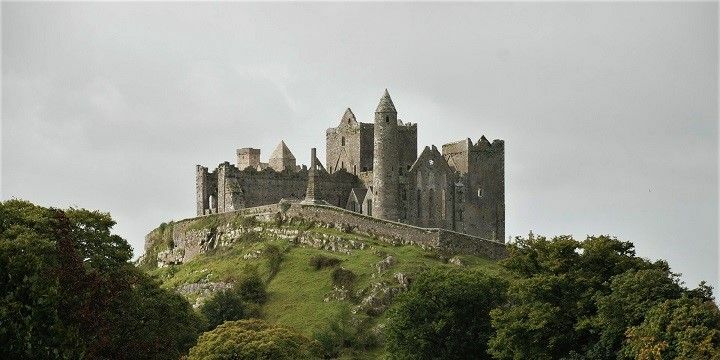 About an hour southwest of Kilkenny lies the Rock of Cashel, one of Ireland’s oldest landmarks. The tower was built in the 12th century on a limestone rock and was inhabited by several kings. Make sure to walk down the hill to see the less popular, but just as impressive, Hore Abbey. For more scenic hikes, head to the Wicklow Mountains National Park, Ireland’s largest national park. Its main attraction is the Glendalough Valley, which translates as “the valley of the two lakes”, where you’ll see the famous ancient settlement of St. Kevin. Rock of Cashel is one of Ireland's oldest landmarks. Ireland’s largest cities are Dublin in the East, Cork in the South, and Galway in the West. Dublin’s best landmarks include the Dublin Castle and Trinity College, and don’t forget to try the two most famous Irish drinks (Guinness and whiskey) while you’re there! If you decide to visit Cork, check out the nearby Blarney Stone, also known as the Stone of Eloquence. Legend has it, those who kiss the stone will immediately gain the power of eloquence. Although Galway is smaller in size, the university city is still a must-see for its pubs, bars, and festivals. If NextStop24 helped you to choose your next travel destination, we'd be very grateful if you’d search for your accommodation and things to do in Ireland through these links. They're affiliate links, which means that we will receive a small commission for every booking made through them. There are no extra costs for you; you'll simply be helping to keep NextStop24 running. Thanks! Ireland was a blast, especially for outdoor enthusiasts like us. We have hiked parts of the Way of Kerry and were amazed by the diversity of the landscape along the trail. I strongly recommend the west coast of Ireland.